Mavic is one of those firms which likes to do things its own way. While other wheelmakers are going wider and wider in the rim department, or pushing carbon on their top-end wheels – or both in some cases – the venerable Annecy firm is sticking to good, old-fashioned aluminium for its best enduro mountain biking hoops. And while some companies are going up to 35mm on rims designed to hold standard 2.3in or 2.5in tyres, Mavic’s Crossmax XLs have a comparatively conservative 23mm internal width. Fresh out of the box, never to be this clean again. So why would you go with such an out-of-date set of wheels, when other companies are so much more “advanced”? Well, for me Mavic’s refusal to jump on the latest bandwagon is quite refreshing. They’ve said that although they famously offer carbon wheels for road riders – they don’t think the material is quite right for MTB rims intended for aggressive use. And they do live and ride in the Alps so I’m inclined to think they know what they’re talking about there. 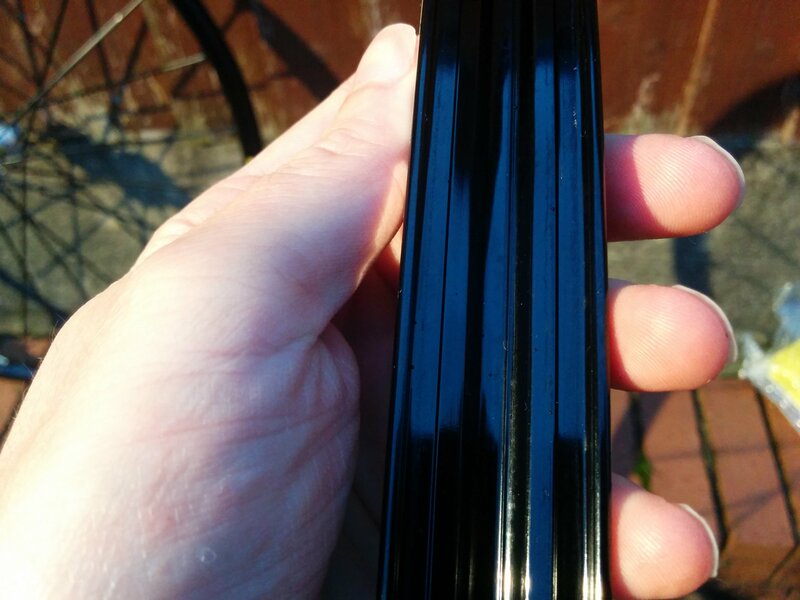 When it comes to rim width, I’d probably have been happier with 25mm internal width – but I knew my old, much-loved Crossmax SX wheels were on 21mm and had never let me down – so I decided to take the plunge on a pair in the CRC sale (yes really, they had another sale!). They actually came with a pair of “Quest” tyres, but I sold those unused, as I already had a good selection of rubber (and not enough money). 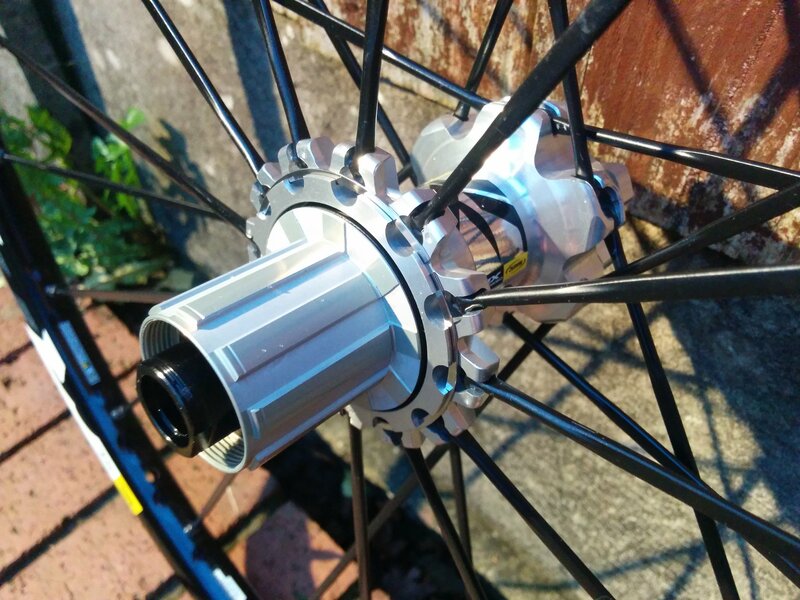 Shiny hub, with intricately machined details. 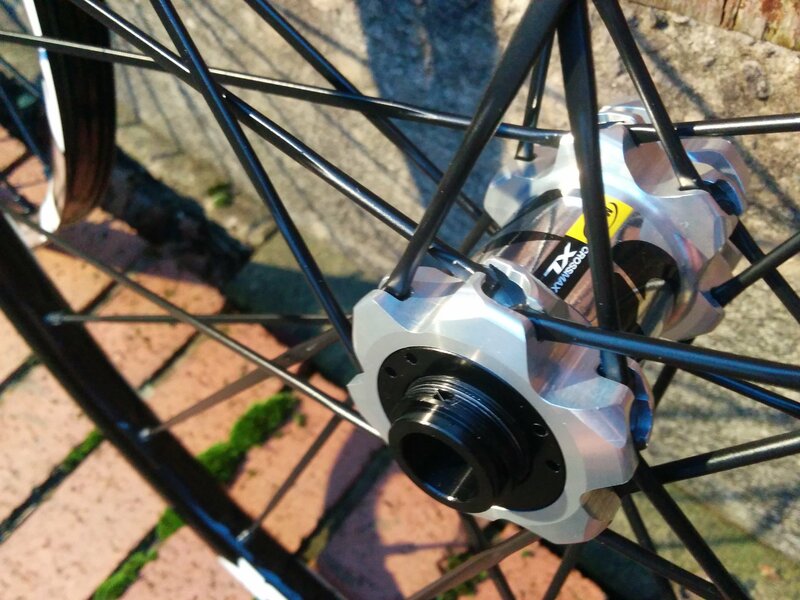 Like all the Crossmax wheels I’ve owned, the build quality and finish on the XLs is superb – with the shiny hubs, bladed alu spokes and stiff rims going together to make a really good-looking package. 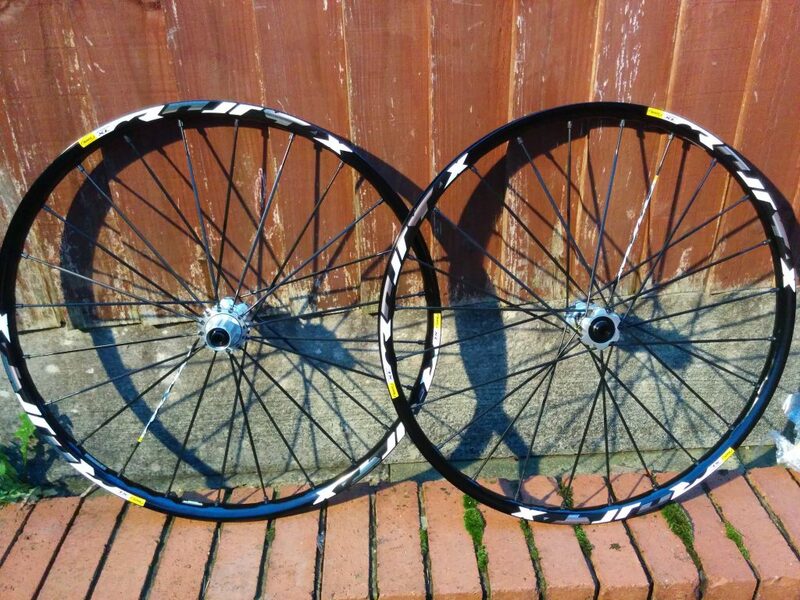 I’ve got nothing against yellow – it’s one of my favourite colours – but I much prefer these rims to the ones on the preceding Crossmax Enduro wheelsets. As you’d expect from Mavic, the rims are UST – so there are no spoke holes and all you need to do to get them running tubeless is add a valve, tyre and sealant. And it was easy to get them up and running with my tyres of choice – a Specialized Purgatory and Butcher initially, later swapping to a WTB Trail Boss and Schwalbe Magic Mary with no drama. The XLs replaced a set of Superstar’s Tech 4 wheels – which are a really good budget wheelset weighing in a touch over the 2kg mark. Mavic’s wheels (which admittedly cost me about three times as much), tip the scales at 1710g for the pair in 650b and 1780g ther pair in 29in (and yes, I bought both sizes). Mavic’s “Maxtal” alloy seems to shrug off damage better than most rims. That weight saving of 300 to 400g was immediately noticeable on both the bikes I fitted them to (a Giant Reign and Kona Process 111) giving them both a fleetness of foot that they’d lacked before. But this wasn’t solely down to the weight – because what Mavic do really, really well is balance weight, stiffness and responsiveness. All those proprietry bits like the 24 bladed spokes and the super-tough maxtal rims mean that the XLs are nice and stiff for their weight – which means you’re not losing too much energy or speed in wheel flex. Both bikes definitely felt as though they were carrying more speed after their wheel upgrades – as well as just being lighter. The ITS-4 freehub has a lovely quick engagement and makes a classy whirring noise when you freewheel, if you like that sort of thing. Despite being stiff enough to get stuck into anything the mountain throws at you, the XLs never feel harsh – which is a criticism that has been levelled at some carbon-rimmed wheels. Shimano freehub, though a Sram XD one is available. Yes, it might be a bit of a pain to source new spokes if I needed to, but touch wood I’ve never snapped a Mavic spoke. So there you go, they ain’t the widest, the lightest or the trendiest – but there’s really nothing I’d change about these fantastic wheels. excellent.good to get a genuine review by people who buy rather than given component.